Alien: Covenant holds together better than Prometheus, but it’s not exactly a frightfest. The alien is going to get you! The Alien series has been through a lot since that first funhouse scare ride 38 years ago. Ridley Scott’s original Alien in many respects still holds up the best, with the four other entries (now five) in the “proper” Alien series finding varying degrees of creative and commercial success. The series has attracted top-notch directors, with James Cameron, David Fincher and Jean-Pierre Jeunet each making a contribution to the canon. And the series has also been dragged through the slime with two spin-off entries pitting aliens versus predators. Kind of like the original Planet of the Apes movies from the ’60s and ’70s, this series has taken the basic concept and twisted it in, out, further into the future, back to the past and mashed it all up every which way in between. It’s already been 5 years since Scott revisited the landscape with Prometheus, stepping back in time (relative to the Alien narrative) to tell a jumbled story of silly Earthlings, a race of giants and pathogens growing into deadly creatures. That one offered some forehead-smacking moments, most notably a self-induced abortion and a couple scientists with all the life smarts of teenagers in a Friday the 13th movie. With Alien: Covenant, there are still a couple disappointing “you’ve gotta be kidding, don’t be stupid” moments of adult ignorance. But the story’s more interesting as the development of the xenomorphs advances to the egg and facehugger mode of incubation; earlier iterations found xenomorphs birthing out of unpredictable locations, including mouths and backs. With the advent of eggs and facehuggers, the groundwork is complete in setting the stage for the arrival of the Nostromo on planet LV-426 in Alien. Alien: Covenant picks up some 10 years after Prometheus. Covenant is another space vessel, this one on a mission of colonization. Housing 2,000 colonists and 1,140 embryos, the ship is still 7 years away from its destination when a neutrino burst sets off alarms and brings the crew out of their sleep state to handle the emergency and make repairs. The crew finds another planet nearby that’s perhaps even more attractive than their intended destination and only weeks away. Given one of the crew members (involving a surprise cameo) dies when his sleep chamber is engulfed in flames during the crisis, the crew is less than excited about going back to sleep. And so they leap out of the frying pan and jump into the fire of the planet LV-223, the setting for Prometheus. The crew is comprised of married couples and the captain, Oram (Billy Crudup, Almost Famous), is an interesting character who doesn’t get fully developed. He thinks he’s been held back professionally because of his faith; he thinks people don’t trust him to make sound, rational decisions. Interesting character, interesting theme, interesting possibilities to pit Oram’s faith against the calculating AI of the ship’s synthetic, Walter (Michael Fassbender, A Dangerous Method). But, no. That’s squandered in favor of CGI xenomorphs wreaking havoc. It’s not long after a team sets out to explore LV-223 when things head south for the humans. And things get complicated for Walter. He’s the latest and greatest version of the synthetic David from Prometheus. Walter’s AI has been toned down compared to David’s in order to make him less “creepy” to humans. And David is resurrected. Still channeling Peter O’Toole and quoting Lawrence of Arabia, he seems to have also picked up on the joys of watching Monty Python and the Holy Grail. In Prometheus, he was decapitated. Game over? Well, no. Elizabeth Shaw (played by Noomi Rapace in Prometheus) put him back together after — as he puts it — he was “badly injured.” That’s quite a flesh wound, David, having one’s head removed from one’s body. Silly sentient synthetic. Fassbender is the perfect actor to pull off the nuances between two synthetic characters and that’s part of the fun of Alien: Covenant. The rest of the characters don’t get a lot of time to be fleshed out before their flesh is destroyed, but there is another leading lady, Daniels (Katherine Waterston, Fantastic Beasts and Where to Find Them). Daniels isn’t strong-willed at first. Having lost her husband during the neutrino incident, she grows into the role of leader as her survival instincts kick into high gear. The movie begins with David conversing with Peter Weyland (Guy Pearce, Iron Man 3). They talk about creation. If Peter created David, who, then, created Peter? It’s high-minded stuff, and it continues the high-wire act the series has stuck itself into: the uneasy balance between pure awe at the power of creation and the devastating end game of that creation. Take it is a metaphor for the human condition. After all, the crew of the Covenant is in search of a new home to replace Earth. The series has moved far past those humble horror roots in Alien. As David noted in Prometheus, by way of Lawrence of Arabia, big things have small beginnings. Now the horror element takes a back seat to lavish effects and intricate story arcs to set the stage for the next xenomorph to jump out of somewhere — or somebody. Part of the charm of 1979’s Alien was the technical challenge of creating the upright xenomorph without making it look like a man in a suit. 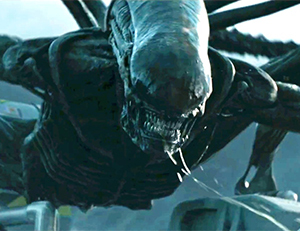 That was a major factor in keeping the alien obscured and in the dark, not to mention it also made things pretty scary. The unknown, after all, tends to instill fear from the get-go; let the mind fill in the blanks and — as a filmmaker — take advantage of it when the mind fills in those blanks incorrectly. Now, with CGI, all sorts of physical permutations are possible and the deadly beasts run around in broad daylight. That’s both a blessing and a curse. Much like the power of creation to bring about destruction, the power of CGI has the capacity to bring about familiarity. And with that familiarity, this series has lost its fear factor.